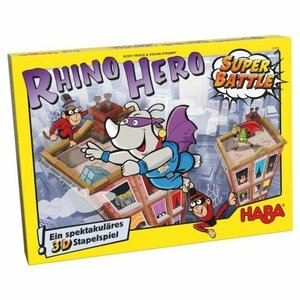 Rhino Hero is back on the job! And this time, not only does the wobbly skyscraper need to be climbed, but there will also be fierce battles between the four superheroes, Rhino Hero, Giraffe Boy, Big E., and Batguin. Who will win the battles and not let themselves be bothered by the mean, hanging spider monkeys in this challenging, turbulent 3D stacking game?